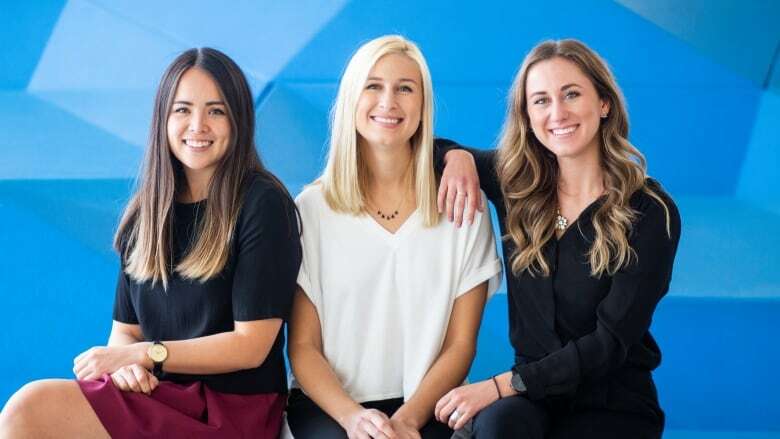 While having dinner one night in February 2017, Ellen Hyslop, Jacie deHoop and Roslyn McLarty had an idea to create sports content, experiences and communities that are for women, by women. And with that, The GIST was born. What would happen if a multi-million dollar industry actually targeted 50 per cent of the population they were ignoring? That's exactly what Ellen Hyslop, Jacie deHoop and Roslyn McLarty are trying to find out. Working in corporate Toronto in 2017, the three Queen's alumni observed that sports talk had the ability to help people strengthen their relationships with others. But there was a caveat. "We noticed that the sports community can be incredibly exclusionary, and that a lot of women and non-avid sports fans have been left out of sports conversations," Hyslop said. The three longtime friends also felt traditional sports media outlets didn't cater to the novice sports fan, making it difficult for those individuals to gain the requisite knowledge to partake in sports conversations. While having dinner one night in February 2017, they had an idea. "We decided to start creating sports content, experiences and communities that are for women, by women," Hyslop said. Hyslop, deHoop, and McLarty, who all worked full-time in the financial services industry, used any spare moment they had to work on The GIST. "We were doing it off our desks, on the weekends, and at night," Hyslop said. In November 2017, they did a soft launch of their newsletter. Last spring, all three quit their jobs to commit to The GIST full-time. "We got a lot of great feedback, a lot of organic growth, and we really did want to take it to next level." Currently, the website features a twice-a-week newsletter which updates readers of major events in the sports world with humorous prose. The site also includes a section called 'GIST U' where readers can develop a better understanding of the rules of eight major sports, as well as an understanding for how each sport's professional league is run. In January, The GIST was one of six sports tech companies selected for incubation by the Future of Sport Lab (FSL). Through the incubator, The GIST will receive four months of guidance, access to resources through Ryerson University, and potential opportunities with Maple Leaf Sports and Entertainment (MLSE) teams. According to Hyslop, The GIST is looking to develop connections in the sports industry. "We're hoping to work with MLSE to determine what sort of project we can work on together," she said. "So MLSE is able to reach a new community, and we're able to grow our audience." Hyslop wants her company to use the FSL as a learning opportunity, and she hopes to become more educated about how the ecosystem of a sports team is different than that of a media company. "We have a lot of big growth goals, and we do need to understand a little bit more of what those companies are looking for," she said. Going forward, The GIST is looking to create audio and video content in order to have more ways to connect with their audience. The company recently expanded to Ottawa, sending out the first weekly newsletter to the nation's capital on Jan. 28. "We're hoping to expand to different cities in the next year... and provide more people with the solution of The GIST."